Scenario & Procedure: Scenario: You have finished shopping at Academy and have put your purchases in the car, as you get ready to get in, thugs try to take your beautiful Sunshine Yellow car. There is no way that’s going to happen! In the ensuing gun battle you are hit in the hip and go down. However the fights not over, so you keep going slumped against the car. 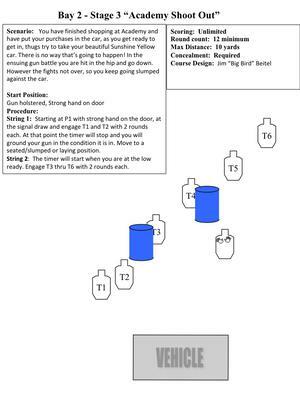 Start Position: Gun holstered, Strong hand on door Procedure: String 1: Starting at P1 with strong hand on the door, at the signal draw and engage T1 and T2 with 2 rounds each. At that point the timer will stop and you will ground your gun in the condition it is in. Move to a seated/slumped or laying position. String 2: The timer will start when you are at the low ready. Engage T3 thru T6 with 2 rounds each.